See the whole world behind you in rich colors. It is also an LCD monitor so it is very light as well as thin. In addition, it has two video inputs so you can connect a camera and a game system or DVD player. This camera can take a direct hit from a rock and it will still work like new. It has also been very popular with RVs because its housing allows you to install the cameras on multiple sides of your RV. In this system, you get 2 cameras and you can mount these cameras anywhere you want. They work next to each other or far from each other, it makes no difference. Basically, it's up to you where you want them and what you want to see, the possibilities are endless. 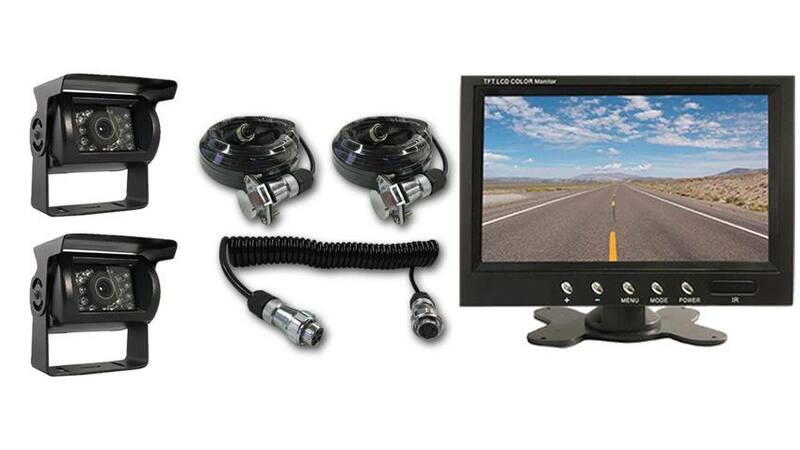 The system includes all parts necessary to connect a One camera system to your Truck and 5th Wheel. You connect the box camera to the top part of your 5th wheel. The 2 Box Cameras can be connected at different places on the vehicle (Photo 1.) You then run the 70ft cable provided (Photo 2.) from the camera at the back of your 5th wheel to your hitch. At that point you connect the 70ft cable to a second 20ft cable (Photo 4.) with the Quick Disconnect provided (Photo 3.) That 25ft cable connects to your monitor (Photo 5.) Now you can see the whole world behind you! The adapter allows you to disconnect the 5th wheel from the backup system (Photo 3.) when you are not towing it.